Get some cultural insight at SaraDar Therapeutic and Thai Massage & Art Gallery and Australian National Aviation Museum. For shopping fun, head to Chadstone - The Fashion Capital or Rotary's Camberwell Sunday Market. Explore the numerous day-trip ideas around Blackburn: Preston Market (in Preston), Ricketts Point Marine Sanctuary (in Beaumaris) and Brighton Beach (in Brighton). Spend the 22nd (Wed) exploring nature at Kinglake National Park. To find other places to visit, ratings, maps, and tourist information, you can read our Blackburn route planner . Singapore, Singapore to Blackburn is an approximately 13-hour flight. Traveling from Singapore to Blackburn, you'll lose 2 hours due to the time zone difference. Prepare for cooler weather when traveling from Singapore in May: high temperatures in Blackburn hover around 20°C and lows are around 10°C. Finish up your sightseeing early on the 24th (Fri) so you can travel to Melton. Melton is an urban area within metropolitan Melbourne, Australia located 35 km west from the capital's central business district. Give yourself a bit of retail therapy at St Anne's Winery and Jeff Jones Plants and Produce. 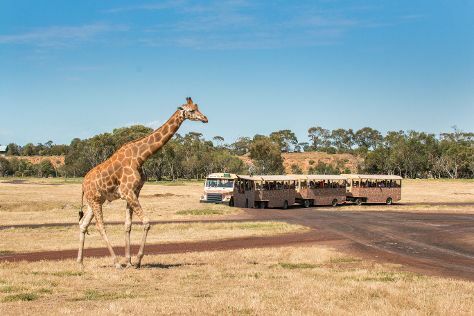 Step out of the city life by going to Werribee Open Range Zoo and Organ Pipes National Park. Explore Melton's surroundings by going to RAAF Museum (in Point Cook), Altona (Cheetham Wetlands, Cherry Lake Altona, & more) and Werribee (Adrenaline & Extreme Tours, K Road Cliffs, & more). There's much more to do: trot along with a tour on horseback, walk around Newport Lakes Reserve, ride a horse along Woodlands Historic Park, and contemplate the waterfront views at Melton Botanic Garden. To find photos, where to stay, and other tourist information, go to the Melton trip itinerary planning site . You can drive from Blackburn to Melton in 1.5 hours. In May, daytime highs in Melton are 20°C, while nighttime lows are 9°C. On the 2nd (Sun), wrap the sightseeing up by early afternoon so you can travel back home.